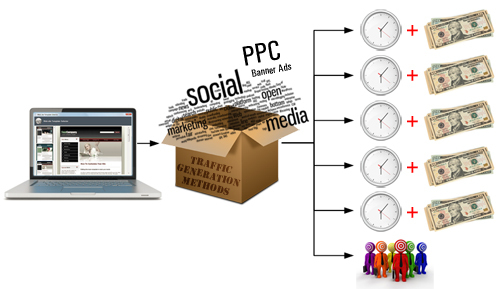 Traffic is the lifeblood of almost every business online. Discovering new strategies of attracting more traffic to your website is essential to building an online presence successfully. Increasing traffic to a web site is also one of the biggest challenges faced by most website owners. 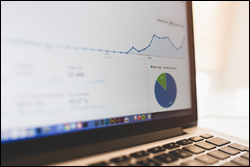 This article is part of a comprehensive article series designed to help business owners learn how to grow their business online sustainably using proven and cost-effective web marketing. We recommend subscribing to our website to be instantly notified when new articles in this series get published. Why Do So Many Small Businesses Struggle To Bring More Traffic To Their Web Sites? There is clearly no shortage of ways to drive traffic to your web site. There are thousands of products and free resources online that can teach you effective how to increase traffic to your web site. The problem is often more about businesses not investing enough time into learning how to generate traffic sustainably, not setting up systems that allow them to manage the traffic generation process effectively, and, in many cases, not even being aware that there are many ways to leverage and automate your web traffic generation. Essentially, the typical approach many businesses take is this: first, you build your website, and then you figure out how to drive traffic to your site. As you will discover in just a moment, there is a better way. Don’t make the mistake of thinking that “outsourcing” your traffic generation will eliminate this problem. Outsourcing is fine if you have great systems in place to manage and process information about your traffic-generation campaigns already. If not, all you will probably do is end up wasting a lot of your time and money looking for a winning strategy that can consistently deliver you a positive ROI. Without laying down a solid foundation and putting proper systems in place, web traffic generation can end up becoming a very costly activity! Getting a regular stream of web traffic sustainably involves setting up a solid foundation online, putting systems in place, testing campaign variables, experimenting with different strategies, tracking results, comparing ROI across different traffic-generation strategies, and so on. 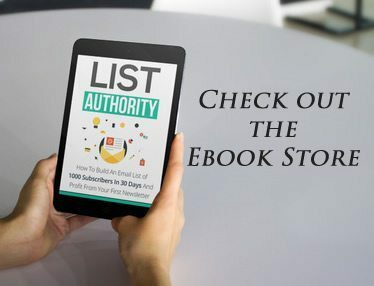 Imagine if you owned a web site where the only thing you had to do to automatically drive new visitors to your business was to publish quality content consistently. This is not fantasy … it’s a fact! As a matter of fact, many website owners are currently doing this … and you can too! 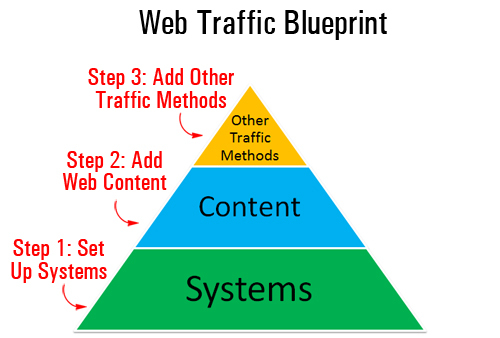 In the Web Site Traffic Blueprint article series, you will discover what it takes to set up an automated traffic-generation machine that can attract targeted traffic to your website, simply by adding regular content to your website. 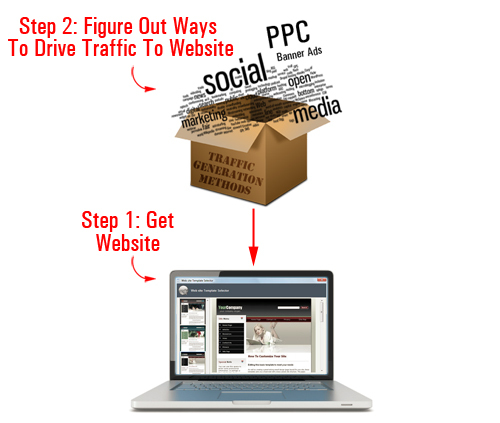 Gain valuable insights about your traffic-generation strategies, monitor results, measure ROI, etc. An Expertly-Configured WordPress Site – What Is It? An expertly-configured WordPress site is not the same as a professionally-configured WordPress website or blog. An “expertly-configured” WordPress site is a blog that is not only powered by WordPress, but has also been expertly set up and configured (either by yourself or professionally) to take advantage of the tremendous power, features and built-in functionality of WordPress and its integration with other sites, specifically in areas like SEO, external site notification and analytics. 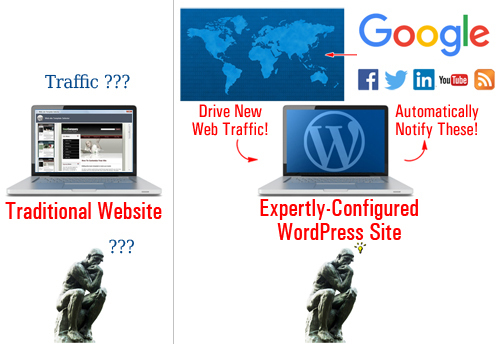 Why Use An Expertly-Configured WordPress-Driven Website? We have published many excellent blog posts on this site about the benefits of using WordPress-powered sites to grow your business online. Understanding how and why an “expertly-configured” WordPress website or blog can help deliver web traffic to your business requires several article installments, which is why we recommend that you spend some time reading our other articles and consider subscribing to this site (this way, we can let you know whenever we publish new information about this topic). Why WordPress? 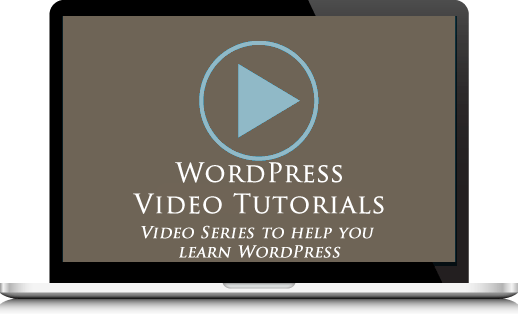 What does WordPress provide that other web platforms don’t? Many websites are built using applications that create “static” websites, or websites with “static” web pages. Essentially, what this means is that your web content simply sit inside your server waiting to be discovered. By itself, your website doesn’t communicate with anything else outside the application; it doesn’t broadcast to anyone in cyberspace, or notify any other website when new content has been published in the site. Think about it … if, with a static website, the content just sits there passively waiting to be found, then the web site owner has to continually promote their site and its content to keep driving web traffic. 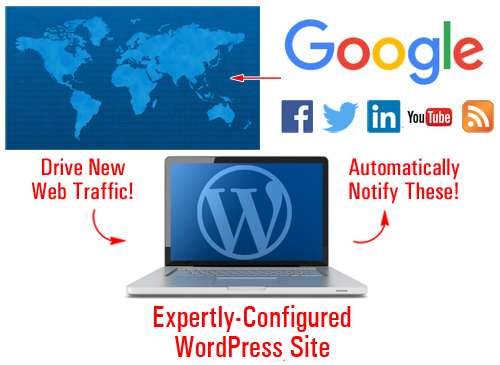 Automate – Your traffic machine not only requires expert configuration of internal WordPress settings, but also integrating your built-in WordPress features with 3rd-party tools and other online properties (e.g. webmaster, analytics and social media accounts). Publicize – Once your WordPress site settings have been configured and integrated with various third-party sites, all you have to do is publish new content regularly and WordPress will instantly notify and inform search engines, your social media sites and other online properties about the new content, giving your content wider exposure online to new visitors. 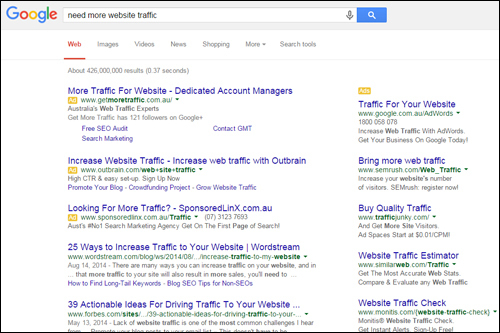 Optimize – We recommend starting with a content marketing strategy to build organic traffic. With the right systems in place, you can also begin to track and understand the traffic generated as a result and gather valuable data that will allow you to make smarter decisions when using new traffic generation strategies. This article is part of a comprehensive article series designed to help website owners learn how to grow their business online sustainably using proven and inexpensive online marketing methods. We recommend that you subscribe to our blog to be instantly notified when we publish new articles in this series. Hopefully this post has given you a better understanding of problems that can affect your website and how WordPress can help you get better results online. To learn more about the benefits of using WordPress for a business website please click on links to visit our related posts section. Has this post helped you? Did we leave something important out? Feel free to add your thoughts below and take a moment to share this information with your friends.